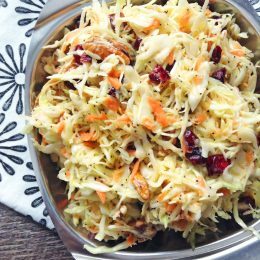 Sweet cranberries and poppy seed dressing on this crunchy coleslaw can turn around even the most hesitant salad eaters. Sometimes my kids ignore their veggies. Shocker, I know. When it happens a few days in a row, it’s usually a reminder to me that we need to switch things up a bit. Even though it feels frustrating in the moment when the kids refuse to eat, I actually appreciate how they keep my on my toes. Because it’s important for them to try lots of different foods… that’s how they learn to enjoy new things! And if they didn’t let me know when they’re getting bored with the usual offerings…well, then we’d just be suffering from a UDR (unidentified dinner rut.) That’s no good. Besides, sometimes I hit the jackpot with a new recipe. I’ll discover something so good, that before I know it, everybody’s back on track eating their veggies. And I feel like a million bucks. This salad became one of those instant hits at our house. It’s crunchy and sweet and pairs perfectly with chicken, pasta, or beans. We called it Ay Caramba! 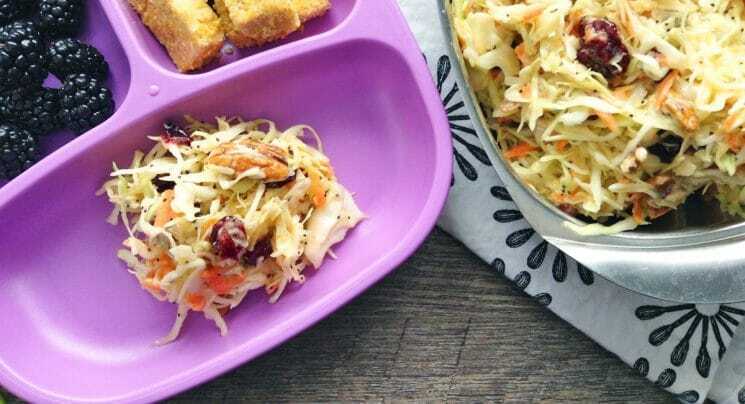 Coleslaw, because with a silly name, the kids really feel like it’s for them. Simply whisk together the dressing, pour it over the cabbage, and stir in the add-ins. Eat it at the table, or bring it along to a potluck or picnic. The nutrition in this salad is awesome: it’s full of fiber, vitamin C, Vitamin K, protein (really!) and antioxidants. Yes, it’s got some added sugars from maple syrup in it, but we’re OK with that. Remember, the aim is to get kids excited about fruits and vegetables! 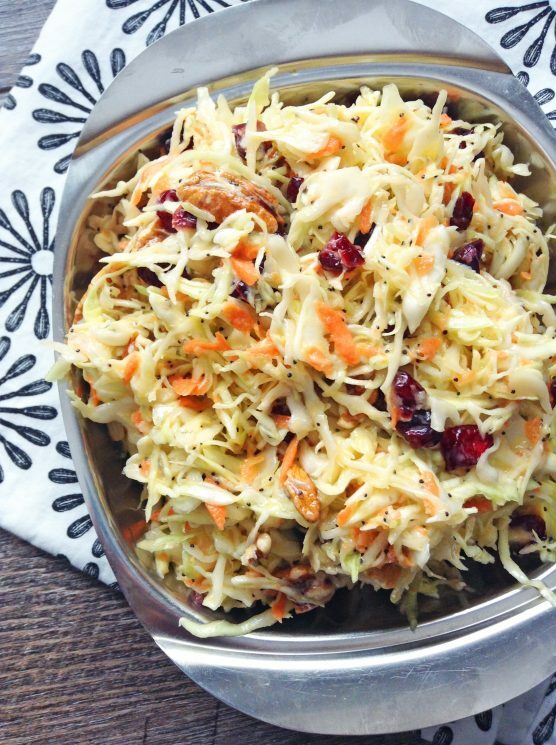 If they enjoy this cabbage salad tonight, they’re more likely to try it another way tomorrow. Kids might not gravitate towards salads at a young age, but I’ve learned not to worry. They’ll come around with time and persistence. 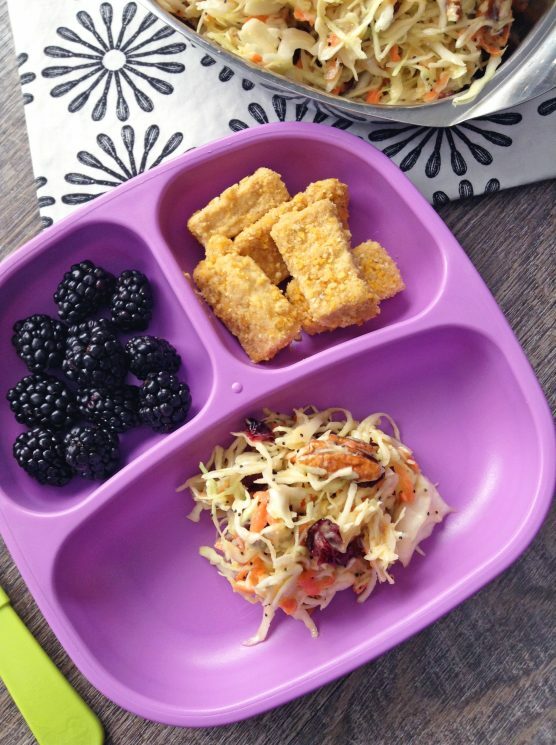 And there are a few good tricks we can use to make salads more approachable to little eaters. That’s what we’ve done here: with finely-shredded greens, super-tasty dressing, and sweet dried cranberries, Aye Caramba! Coleslaw is totally approachable. Mix it all together with your kids, place the bowl on the table, and see who you convert to a salad-lover tonight. Whisk all dressing ingredients in a small mixing bowl or glass jar. In a large mixing bowl, toss all ingredients together until combined with dressing. Serve immediately or let marinate for 30 minutes. Awesome cabbage facts! Never thought I’d say those words either. 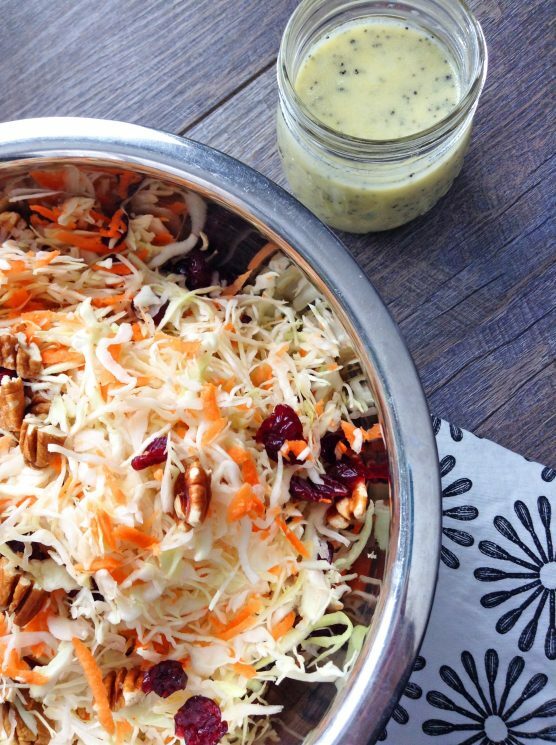 I use the shredded cabbage lots for salads and just use our regular salad dressings/vinaigrettes. I love the extra crunch compared to regular greens. Maybe I’ll venture to mix them! Yum, this looks crazy good. And I’m not at all a cole slaw fan, but this looks like it could be a good substitute. Wow- I love cabbage, but didn’t even realize those Vitamin K facts! I will have to try this recipe out on my kids this week. I didn’t know that about cabbage. I just thought of it as roughage and a recipe filler. This is great. I’ve been wanting a new salad recipe. I made this last night and was awesome!! A couple of the kids picked out “various things” but overall it was a hit. I ate the rest for lunch today and it was even better…the cranberries had softened. I’ll be making this more often! I tried the salad tonight, and it was so good!!! Ground Mustard = powder, not prepared mustard, correct? Just making sure.